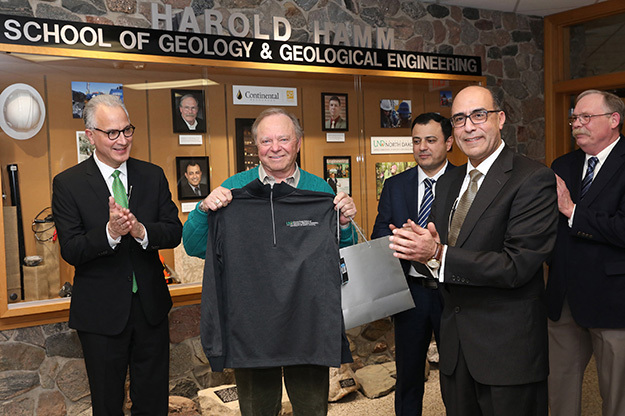 Harold Hamm receives a gift from the Harold Hamm School of Geology & Geological Engineering at UND. 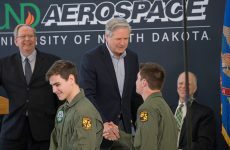 The billionaire oil mogul, who pioneered drilling in western North Dakota, took time on Friday to answer questions from UND engineering students. Hamm poses with UND President Mark Kennedy, UND Petroleum Engineering chair Vamegh Rasouli (back), UND Engineering Dean Hesham El- Rewini and Geology & Geological Engineering Associate Professor Stephan Nordeng. Photo by Jackie Lorentz/UND Today. If you want to succeed, you’re in the right place to earn that degree. 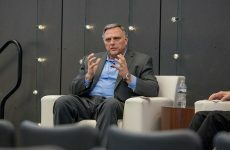 That was the advice from Harold Hamm, founder and CEO of Continental Oil, as he answered student questions about success, finding that first job, and the future of the oil industry. Hamm pioneered the development of the Bakken oil fields in western North Dakota and is a UND benefactor. He answered questions from students Jan. 26, and visited campus while in Grand Forks for the North Dakota Petroleum Council annual meeting. Hamm was introduced by Hesham El-Rewini, dean of the College of Engineering & Mines, in the packed atrium. “Five years ago, we celebrated naming the Harold Hamm School of Geological and Geological Engineering,” said El-Rewini, thanking Hamm for his continued support and welcoming members of the Petroleum Council, who also attended the talk. President Kennedy hosted the event, and asked Hamm questions submitted by students. They ranged from getting that first job to oil prices and technology in the oil fields. 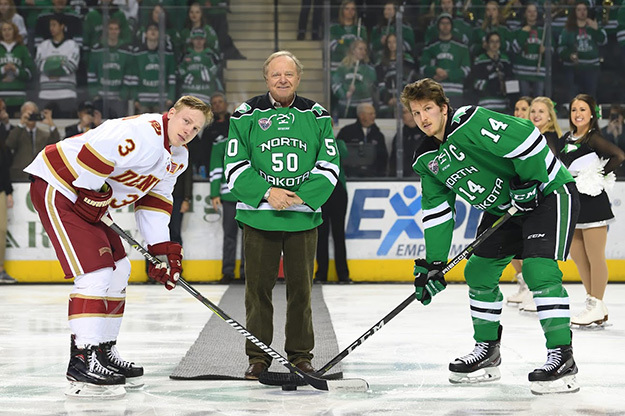 Hamm dropped the ceremonial puck before Friday’s UND hockey game between the UND Fighting Hawks and the Denver Pioneers. Image courtesy of UND Athletics. “Like lots of you, I grew up on a farm,” said Hamm. 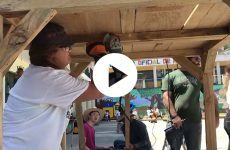 “My first employers were my parents, and I grew up milking cows and doing chores, raising crops and caring for livestock. You can’t get better mentors than that. First impressions are really important, Hamm said about meeting new people. “Be interested in the person you’re meeting.” Prepare for the meeting, learn about their interests, focus directly on them, align your thoughts with that person and show your best side, he said. To be more marketable in the oil industry, Hamm said, you need to learn everything you can. 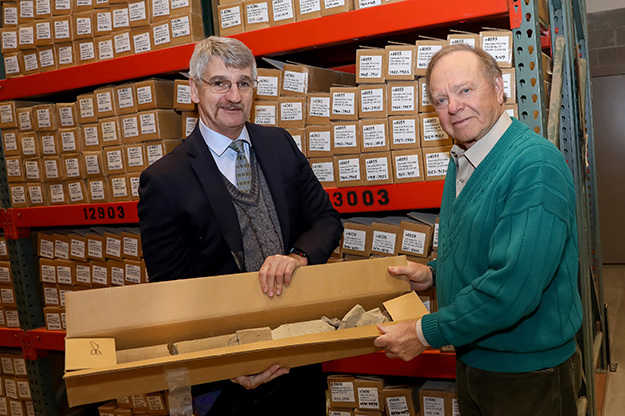 Hamm (right) examines soil core samples with Jeffrey Bader, director of Wilson M. Laird Core & Sample Library, which is located on the UND campus. Photo by Jackie Lorentz/UND Today. Hamm said his company began with direct drilling rigs, and as technology evolved, they were able to drill horizontal wells beneath cities. By using injection, he said, they could withdraw five times the volume from a horizontal well than a vertical well. Hamm credited much of the Bakken’s success to the Laird Core and Sample Library on campus, which houses core and drill cuttings from nearly every test and well drilling in North Dakota. What’s your view of how much oil we can recover? asked a student. Will we see $100 oil again? asked President Kennedy. A related question was when oil prices will go up. In response to a question about why Hamm has given millions to UND, he replied, “We wanted to hire local people. If we had a school that could teach the skill sets at home, we knew we’d have a lot of great people. There are no better workers than North Dakotans.